My grandmother would shake her head when hearing of tzoros/sorrows come to one she loved. As though to underscore the unfairness of bad things happening to good people, she would then say, “she has a heart of gold.” In her simple pained reflection was an awareness of goodness so deep that it should trump the vagaries of life. We know that such is not the case, and yet it is. Acts of kindness that make a difference in the lives of others, the golden hue of a heart so full touching the world like a summer sunset, these challenge the vagaries of life and cast them in another light. It is a light that shines through and beyond the difficulties of life. 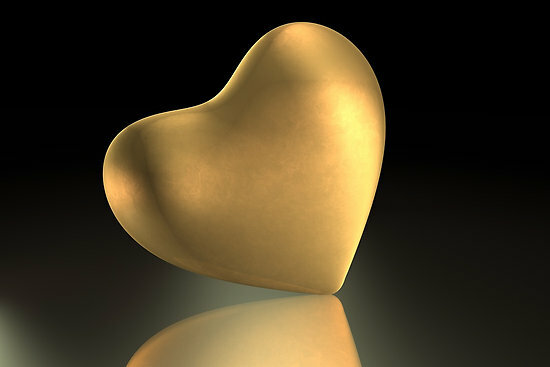 A heart of gold is that which is deepest within. It conveys the same sense as the Yiddish phrase, a gitte n’shomah/a good soul. It is about a way of being in the world. We know such a heart, such a soul when we stand in its presence. The inner light shines out and is no less bright on the outside. Of such clarity, the heart of gold, I am puzzled by the lyrics of Neil Young’s song of that name; “I want to live, I want to give, I’ve been a miner for a heart of gold. It’s these expressions I never give that keep me searching for a heart of gold and I’m getting old.” With life going by, I am not clear if the quest is to discover after all a heart of gold within oneself, or if it is a sad song of seeking and not finding of goodness in the world. It is not for us to identify the nature of our own inner being, but to live in the way we know will bring good to the world. We know what good is and the golden glow it gives when we encounter it. It does not require a great search, but only to open our eyes and hearts to be touched by the simple acts of kindness to be witnessed every day. To live with optimism, to have faith in the power of goodness to make a difference, to live without disconnect between the values we know within to be right and the values we express in the world, this is the way of Torah as it is meant to be lived. It is the way of Torah as a Tree of Life whose paths are peace, a way that is taught in the simple ways of simple gifts, as simple as the ordinary deeds we are blessed to receive and know to be a gift. In the Torah portion called T’rumah (Exodus 25:1-27:19), instructions are given for the building of the desert sanctuary, the mishkan, and for all of the holy furnishings to be within it. 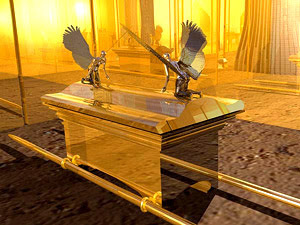 Of the holy ark itself, that is to be made of shittim/acacia wood, Moses is told, v’tzipita oto zahav tahor/and you shall cover it with pure gold; you shall cover it inside and outside…. The wooden ark becomes in effect three boxes contained one within the other, and yet they are all one, a seamless whole. A heart of gold, indestructible, surrounded by a body of wood, organic matter, one day to decompose. And on the outside, a golden exterior is one with the innermost. Of wood, eytz, that is destructible and does not shine, that which gives bodily form to the container of Torah, the rabbis ask why is it at the center? It is because the Torah is called eytz Chayim/a Tree of Life. Of the gold that is to overlay the wood within and without, the Torah says, mibayit u’michutz, literally, “from the home and from outside.” The way we are at home and the way we are in the world outside is to be one. The rabbis offer the nature of the holy ark’s construction as a teaching on the importance of personal integrity, that we be the same on the inside as on the outside, that our deeds be consistent with our expressed values. Among the questions that the rabbis imagine we shall be asked when we come on high in the gathering of our days, there is this one: tzipita lishua/did you expect/anticipate salvation? It seems at first a strange question, until we consider it in the context of the living of our days now, hearing it as a challenge to live with optimism and not succumb to despair. A question that we need to hear now, in this world, in this life, it is a reminder to live with hope, with faith in the possibility of repair and wholeness. The word tzipita as “to expect, to anticipate,” is the same word as v’tzipita, “and you shall cover/overlay” the wood of the ark with pure gold. The golden glow of kindness that emanates from within is its own promise of salvation. Whatever sorrows are encountered in the living of life, the heart of gold shines through and leaves a lasting glow.